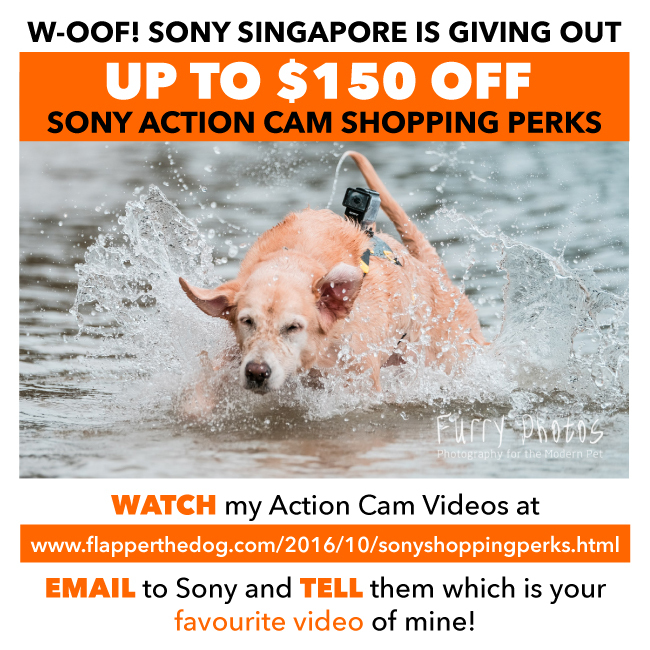 I am so incredibly happy to announce that Sony Singapore is giving out up to $150 off Sony Action Cam Shopping Perks! Woofs cannot express what a happy tail-wagger I am with my new Action Cam FDR-X3000R. It has come up trumps as a remarkable Point-Of-View (POV) camera especially with their revolutionary new optical stabilzation called Balanced Optical SteadyShot™ (B.O.S.S.). With this shopping perk with a massive $150 off the Sony Action Cam, it is now more affordable and I hope many of my friends can own one too. If you are wondering if the Sony Action Cam FDR-X3000R is really that worth the money, I have painstakingly put together my personal review of this camera. All I can say is, this new Sony Action Cam is the perfect, purrrfect, pawfect camera for capturing all of one's life moments. But of course, the actual videos speak louder than words. So if you want to see how impressive this camera really is, you can watch the videos below and decide for yourself. During my secret birthday getaway, I #LAB-tested the FDR-X3000R in every condition possible - both in Frodo and my POV as well as human handheld. Above-water, underwater, day swimming, night swimming, indoors, running in the field, daylight, night-light... whatever we could have tested, we tested. All videos and images taken with the Sony Action Cam are original footages. No colour enhancements or video adjustments were made. With all that said, here are the steps to follow to receive this wonderful shopping perk. #1 - And Let the Staycation Begin! #7 - It's All About Frodo. Frodo Choo. Shopping perk will be emailed to you. Sony Action Cam Shopping Perks is valid from 28th October - 30th November 2016. *Shopping perk is now extended till Christmas Day, 25th Decemember 2016! To compare prices and specifications of the Sony Action Cam, please go to their website.